Sometimes, when a notification appears, opening the app to deal with it is tedious, we just want to achieve our goal directly from the the notification. Fortunately, interactive local notification was introduced in iOS 8 to help. Interactive local notification has actions we can interact with, it is based on ordinary local notification that is just to notify. Let’s go through ordinary local notification first. After requiring the notification permission, we create a local notification, it’s usually triggered by something like a button tap. newLocalNotification.alertBody = "You can't do anything with me!" Until now, we get a local notification whose entire functionality is to notify users. Let’s move on. Now that we have an ordinary local notification, it’s time to add actions to it. 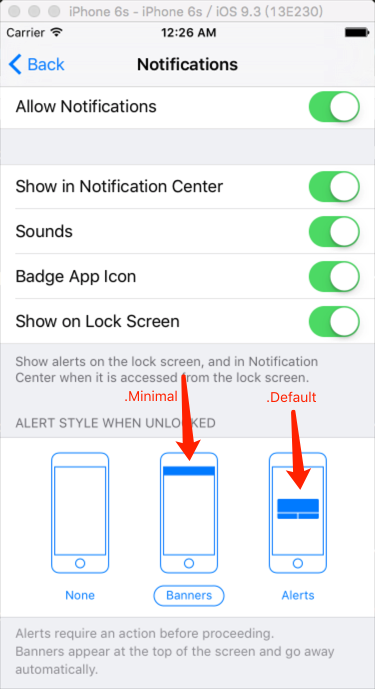 Note, we should use UIMutableUserNotificationAction instead of UIUserNotificationAction because UIUserNotificationAction’s property cannot be set. A UIMutableUserNotificationCategory object encapsulates information about custom actions that your app can perform in response to a local or push notification. We create actions and put them into categories, then return an array of categories. In our case, the array just contains one category. destructive decides the appearence of the action, authenticationRequired decide whether password is needed when executing the action. We also need to add newLocalNotification.category = "ExampleCategory" in createLocalNotification() just before scheduling.